Quick Restoration Tip and Info. Of course wear and tear is to be expected with everyday use, and some stone is more sensitive than others. When marble and granite has lost its original shine and is worn, stone restoration is required. Special care is required for the tumbled, honed and newly offered brushed stone products being used in the industry today. It is important for the stone-owner to understand the different methods and frequencies required for sealing natural stone products. Granite, marble and limestone need cleaning and sealing, and the maintenance applications vary. Scratches, stains, etch marks and other blemishes can be removed by grinding and honing with various abrasives. When applicable, polishing restores the deep luster and high gloss the stone had originally. Tumbled, honed and polished finishes can be brought back without replacement, dust or mess. Other services offered are epoxy fill work, stain removal and crack and joint repair. Once stone restoration has been done the next step is to educate the client about care and maintenance of their natural stone. Marble polishing, granite and limestone honing and polishing will bring about beautiful results, but unless the individual is properly cleaning and sealing it the result will be short-lived. Proper maintenance of natural stone is very important. Classic Marble Restoration is a "Father and Son" owned marble restoration, cleaning, sealing, and polishing company that is licensed and insured serving all of South Florida, including Weston, Miami, Fort Lauderdale, and Boca Raton. Our highly trained and skilled service technicians are experienced with every type of marble, granite, terrazzo, and natural stone surface. Classic Marble Restoration provides natural stone polishing, stone restoration, marble cleaning, and sealing services for Residential homes, Commercial Properties, and Yachts. In addition, we offer periodic stone maintenance programs to aid in the prevention of stains and abnormal wear. Our techniques are state-of-the art and we specialize in dust-free solutions for your marble, limestone, granite, onyx, travertine, saturnia, quartzite, and terrazzo surfaces. Marble is a durable and soft stone. It is elegant and graceful too. People who want to have a classy home décor always choose to go for marble flooring. Marble floors always have a touch of class and sophistication. But maintaining them is not that easy. If you have installed this classy stone on your floor, you will know how difficult it is to maintain these floors. If it starts cracking due to any external reason or pressure, it would negate your class statement and style. In fact, nothing looks as dull as a discolored or cracked marble floor. Proper steps need to be taken to maintain the beauty and luster of the floor. Marble surfaces are basically shiny and so waxing of the tiles isn’t needed to add that extra luster. A polish can do wonders and enhance the look of marble floors. Since it is highly porous, they get scratched easily by vinegar, orange, tomato juice or any other things that contain acids. There are even some kinds of marble that gets etched by water. So, marble cleaning must be done with the right material. In the very first place, marble should be sealed if you want to protect it from stains. But right sealers and treatment need to be installed for bringing out that gracefulness on the flooring tiles. It should be cleaned with a neutral pH solution, as it is a sensitive and porous material. You must never use the kitchen detergents that you use normally for cleaning the space. The components of the detergent may corrode the tile surface or discolor the floor area. However, after using the right marble cleaning solution, wipe the tile to remove the water spots and blemishes. In order to keep the marble tiles shiny and attractive long, keep the surfaces of marble dust free; dust and mop with soft and clean cloth occasionally; clean the tiles with a neutral ph solution and water and always change the mop water while cleaning the surface. However, although marble floor maintenance is a constant process but at times you should also opt for marble restoration. With natural stone restoration, you can remove scratches and dull spots from the surface of the marble floor. This is generally done with the help of an abrasive process, which is popular as stone grinding. The process of stone grinding needs to be done properly or else the floor might get damaged. So, with proper restoration, you can restore the shine in your house and get the matte finish that you desire on your floor. 5 Benefits of Marble Flooring!!! Sure, it's expensive to buy and have installed. It must be cared for properly to keep it from staining or being scratched or gouged. It makes guests green with envy and homeowners sweat. But it's so beautiful, and even in small quantities it says luxury, quality and magnificence. What am I talking about? Marble flooring- it's been around for ages and is making a huge comeback in home remodeling. Here are five reasons to go with marble instead of linoleum. All over the world there are marble floors that were laid down thousands of years ago and are as beautiful today as they were then. Check out The Greek (400 B.C.) and Roman (27 B.C.) Parthenons, the Aztec Temple of Tenochtitlan (1400's), The Taj Majal (1633-1635) and The Lincoln Memorial (1922). All used marble extensively. It's proven that it doesn't wear out even after millions of feet have passed over its surfaces. Ah, that makes it far more affordable than having to hire professionals. Laying marble tiles isn't that much different than travertine or ceramic tiles. This is a perfect DIY (do-it-yourself) project for any room in the house. A marble bathroom floor or countertop just looks classy. Since marble comes in all kinds of colors and patterns, the choices for projects is virtually unlimited. Few upgrades during remodeling add as much resale value to the house as marble flooring. Linoleum or faux wood tiles are scoffed at and look cheap. Install marble tile flooring and suddenly people are not only coming back to look again, but to make offers. Tastefully done, marble flooring can add thousands to your home's resale value. For those who are allergic to dust and have trouble with carpets, marble is a perfect choice. It's naturally resistant to bacteria and allergen buildup. Fungus doesn't grow on it at all, and mold doesn't even try. A dust mop easily takes care of pet hair, dust and dirt. Because of its density marble flooring is naturally resistant to scratches and stains. That doesn't mean that it is impervious, however. It still must be cared for properly so it can last with its beauty intact. Products made just for stone flooring and marble flooring aren't as expensive as they sound, and they can be found at any DIY store. These are just five of the benefits of marble flooring. If you are looking at buying a home with an existing marble floor and it looks scratched or dull, call a professional to get estimates on refinishing. You may be pleasantly surprised to find it won't cost an arm and a leg, and with the floor restored to its glory, your guests will be jealous of you. 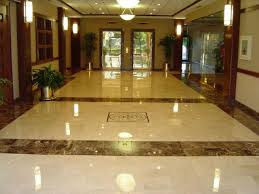 Hiring a Fort Lauderdale marble cleaning company is a lot more beneficial than doing the job on your own. Over time, marble begins to fade and lose its natural sheen. You might try to do the marble cleaning yourself but find the job to either be too expensive or too much for you to handle. Thankfully, our Fort Lauderdale marble cleaning company can help you with anything you need. We will be able to provide superior marble polishing services so that your tables and countertops look as good as new. With over a decade of marble cleaning, restoration and polishing experience, the choice is obvious. Our Fort Lauderdale marble cleaning experts will provide superior quality service to ensure that you are happy with the finished product. There is absolutely no reason to do the cleaning and polishing yourself when our Fort Lauderdale marble cleaning professionals are here for you. You will notice that hiring a professional marble cleaning and restoration team makes your life a lot easier. Marble can sometimes be a tricky stone to clean, so sometimes professional help is your best option. Here at Classic Marble, we handle all jobs, big or small. Whether residential or commercial, and even yacht marble cleaning, we have the expertise to assist you. There are just some projects and renovations in the home that are best left for the professionals, and polishing all of the marble happens to be one of them. If you live in the Fort Lauderdale area and need marble cleaning or restoration, give us a call today! How does marble become damaged? If you have marble in your home you know how easily it can be damaged. Whether it is in your bathroom, kitchen, or bedroom your marble is always at risk. There are some common mistakes that can be avoided though. Your bathroom counter top for example, can suffer damage from a curling iron or flat iron that is laid down while still hot. Think about all the things that are used in a bathroom such as razors, hair barrettes, and cans of shaving cream for example. All of these products can and will damage your marble if not handled properly. What about in your kitchen? This is a war zone; you have everything from hot pots and pans to sharp knives and cheese graters. Beware of what cleaning products you use as well. In order to disinfect your kitchen you may use harsh products, so always check that they are safe first. These are a few things you can try to avoid, but in day to day life it may prove tough. If your marble does become so damaged you don’t feel you can fix it yourself, don’t wait to call a marble restorationcompany such as Classic Marble. The longer you wait the more damage that will be done and the harder it will be to fix.